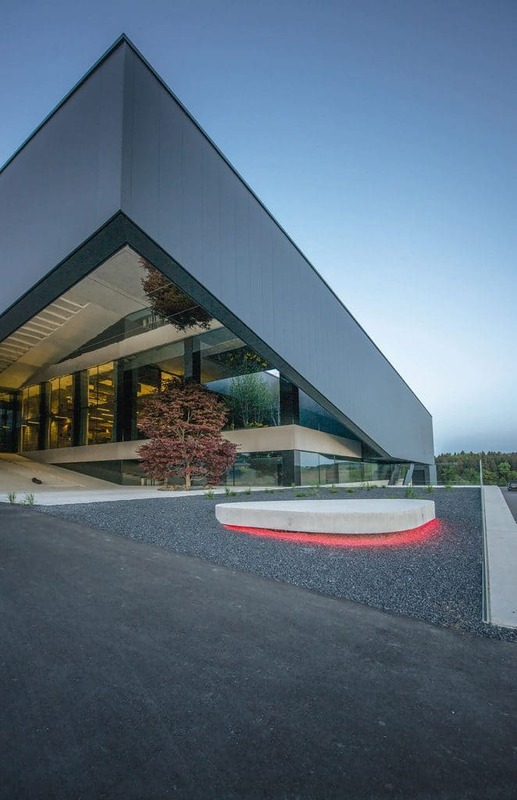 The new headquarters of the company STEINBAUER Performance Austria GmbH (worldwide operating manufacturer and developer of additional modules for engine optimization and complete vehicle control) includes research and production areas as well as development departments. The aim was to design a modern and dynamic building that would be individual and special for the company. 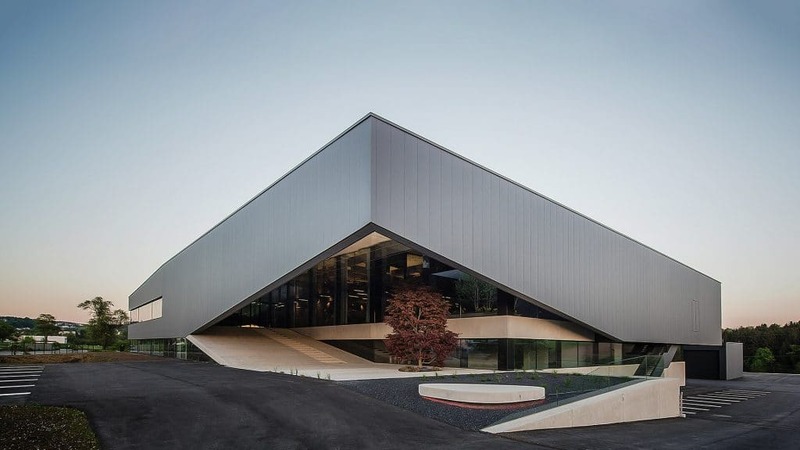 The new headquarters of the company STEINBAUER Performance Austria GmbH (worldwide operating manufacturer and developer of additional modules for engine optimization and complete vehicle control) includes research and production areas as well as development departments. The aim was to design a modern and dynamic building that would be individual and special for the company. High-quality materials and tailor-made for the wishes of the users. With the company DOMICO, from Vöcklamarkt in Upper Austria, this requirement could be met. In October 2016, the new company headquarters was even awarded the Austrian State Prize for Architecture. 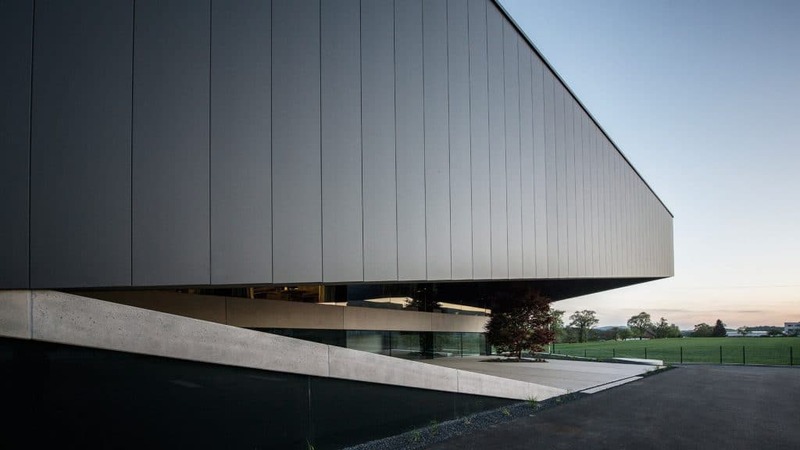 The building is a striking square body that presents itself from the outside as closed and introverted. In order not to make this closed shell appear difficult, the upper floor is lifted off from the massive exposed concrete base by a dark curtain facade. The only opening in the building is the façade in the entrance situation. Like a shell , the dark façade shell is literally inverted and opens into a massive entrance ramp. An additional special feature of the entrance area is a reflective metal ceiling. The facade of the upper floor was made of DOMICO products. 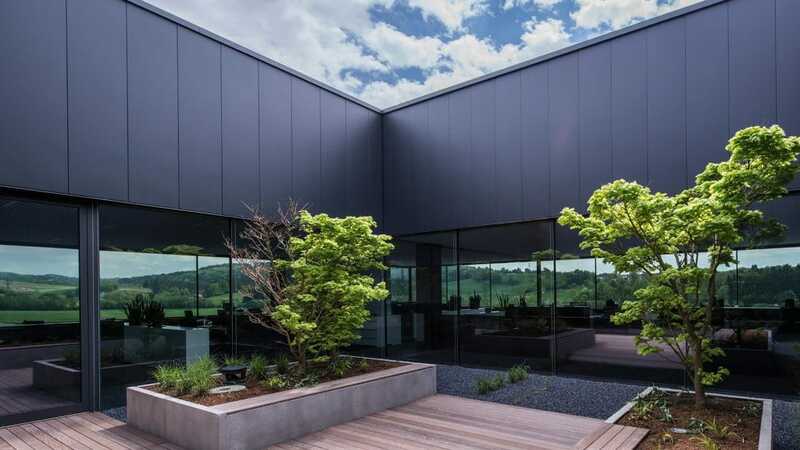 Due to the client’s requirement to build an individual and striking building, a façade surface was developed especially for the building project. Accordingly, the surface, the graphic design, the colouring and the 3D finish are specially produced. 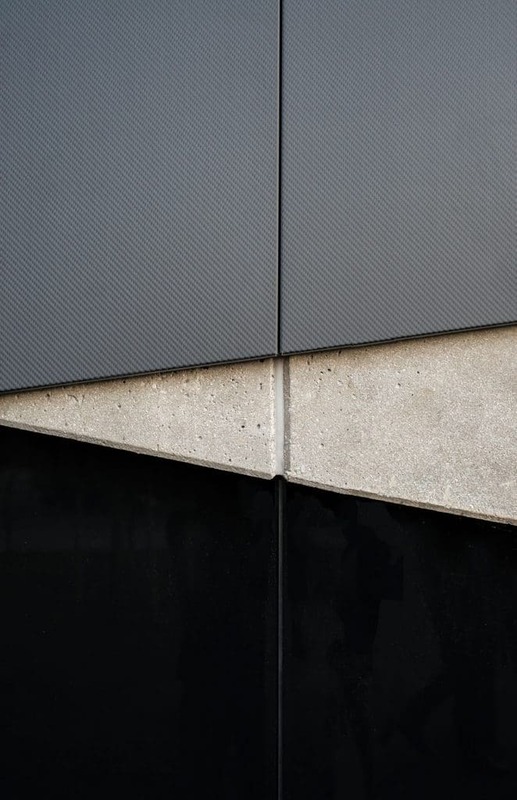 The Planum® façade was designed in carbon optics, which was based on the products and packaging of Steinbauer. All rooms of the building are flooded with daylight by four purposefully set inner courtyards, which are coloured according to the four seasons. The inner courtyards themselves offer terrace surfaces. The building is designed in a reinforced concrete skeleton construction and infilled with a prefabricated construction. The base area is made of sandblasted exposed concrete, above which the surrounding skylight strip is arranged. Subsequently, the upper storey with a curtain-type cassette façade, executed in DOMICO Planum, stands out from the plinth zone. The entrance area is also made of fair-faced concrete, above which the curtain wall cantilevers out by means of the generously dimensioned steel girders. The ceilings are hollow plank or trapezoidal sheet ceilings.